Monsters University toys from the movie Monsters University will be at retail in mid 2013. 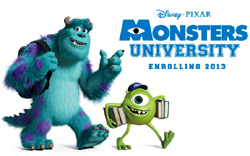 Fans will recognize the movie as the prequel to Monsters Inc, Pixar Animation’s worldwide box-office smash. UK toy company Spin Master have been appointed by Disney as the master toy licensee for Monsters University. Spin Master will release a range of colourful Monsters University plush toys in varying sizes to coincide with the launch of the movie. There will also be Monsters University figures and playsets. 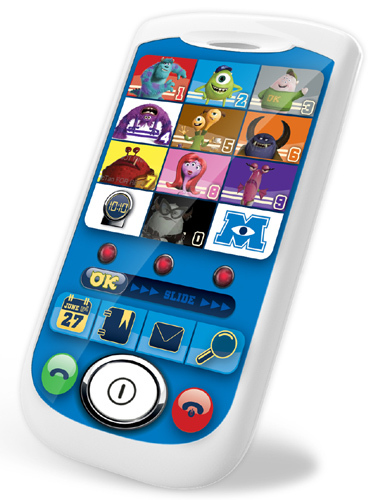 In electronic toys, Inspiration Works are releasing the interactive Monsters University Tablet and Monsters University Smartphone packed with games and quizzes. What’s more, Oldham-based Character Options are also set to release a range of collectable toy Monsters University figures encased in slime pots, called Slimy Figurines, and a Monsters University Slime Machine Playset. The continuing success of the Monsters Inc franchise with the Monsters University movie will drive volume sales of Monster University toys. This entry was posted in Monsters University and tagged Monsters University Toys. Bookmark the permalink.